I set my alarm for 4 AM to get up and leave with Paul Jeffrey and ... my alarm DID NOT GO OFF! I either turned it off in my sleep, or I turned it off after I double checked it. I had a knock on my window at 5:00 - 5:00! - from Jo and I flew out of sleep in a panic. Well, their alarms went off at 4 AM, but they lingered over coffee and packing up, so I wasn't in the doghouse. 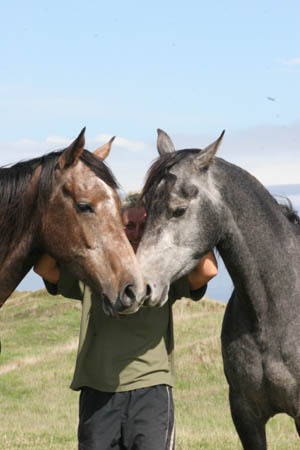 Paul has been around horses all his life, and competes with his endurance horses nationally and internationally. He's qualified for WEC Malaysia on his horse Chinook, who last completed the Horse of the Year ride. 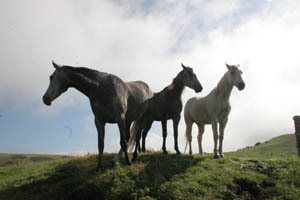 Paul is instrumental in New Zealand endurance as a board member and as a sponsor of many of New Zealand's rides - for the Nationals he sponsored Carlos and Mariola as the foreign Spanish FEI vets. 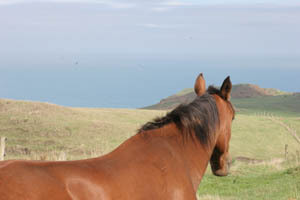 He's also influential in getting a lot of outside sponsorship for New Zealand rides. I heard some of the Ruahine Organizing Committee members talking about the Nationals - it cost them some $26,000 to put on this ride. Paul came forward with his funding of the foreign vets, and with organizing much of the outside sponsorship, including the main sponsor CopRice. He's absoultely committed to the betterment of New Zealand endurance, and is willing to take figurative blows to get the sport there. He's also responsible for endurance.net being over here for Horse of the Year and Nationals. He may come off to some people as stern and uncompromising, but they don't know there's a great sense of humor lurking underneath. For example, his offering to share my RAVEN with his ripping-stuffing-out-of-stuffed-animals DOG. We did get away from Rangiwahi at 6:20 AM, and in all it took us 7 hrs to get to Paul and Madonna's home outside of Auckland. That included stops for coffee (20 min), letting the horses out for a stretch and grass (20 min), and filling up with petrol (15 min). Their float is a nice big one, smooth driving, and the horses are standing in the stalls right behind you. It's funny to hear them snorting right there and be able to turn around and look at them. It was a beautiful drive, right by Mt Ruapehu (couldn't see it on my quad ride yesterday because it was in clouds) and Tongariro National Park. Mount Ruapehu at 9176 ft is an active cone volcano. This was New Zealand's first National Park, and one of the world's earliest, created in 1894. Chief Te Heuheu Tukino gave the land to the people of New Zealand because they were sacred lands and he wanted them always protected. Just a half hour north by bird, or an hour by horse float on the very winding roads over the volcanic ground covered by thick bush, is Lake Taupo, the world's 9th largest caldera. It's a huge lake that we drove alongside of for a while. There were a number of sailboats out on the still water, and the blue-gray lake blended into blue-gray fog and clouds in the distance. The Spanish veterinarians Mariola and Carlos arrived at home (anywhere I open my suitcase is home now) just after we did. We had drinks on the lovely porch with Madonna in the mild weather and talked. I sat and half listened and half chipped away at the multitude of emails and photos I was two weeks behind on. We all went out for Indian food in the nearest town, Pukekohe, where, as usual with Indian food, I ate myself silly. I am the only person I know who, despite all the stress and hassles you constantly face, gained weight travelling in India because of all the food I consumed. I still can't control myself! 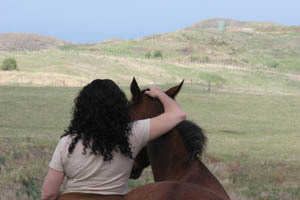 I was planning a nice relaxing week on the North Island, seeing more horses and endurance people and finally catching up on my internet work, when Paul told me I'd get a ride to the airport Wednesday morning with Carlos and Mariola. "Why am I going to the airport with them?" "You leave tomorrow." "No I don't!" "Yes, you do." I disagreed, so I went up and dug out my flight schedule - and I discovered I did NOT have a week left in New Zealand! What the heck! I threw away my organizer because obviously it wasn't organizing me one bit. I need my usual little calendar. Everything written in pencil, of course. That was the shortest month I've ever had - I am not ready to leave New Zealand!! 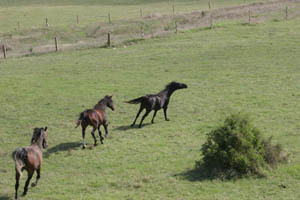 So my only look at horses on the North Island were Paul and Madonna's horses of Casa Enduro Endurance Racing. As if New Zealand weren't Paradise already, they have a bigger farm 25 minutes away, right on the Tasman Sea, and I mean right on and above the sea. Oh my god! A 170-acre slice of Extreme Paradise on the rolling grasslands about 500 feet above the ocean, with 2 trails down there to ride along the beach forever. Great climbing work for the horses, uphill and downhill to the beach, then great sand training along the ocean. Trevor had said his beach was the best beach in the world to ride on ("Much better than Paul's"), but I really would have liked time to have to compare and prove him right! 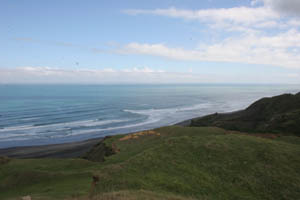 From the highest hill overlooking the water you could see miles up and down the coast of the Tasman Sea. Stunning! My pictures were nice, but completely inadequate to show the grandeur of the place. And the clouds for background sculptures were dramatic. Everywhere I turned I kept saying, "Oh my god!" And the horses - they have about 16 or so, and I didn't see one horse I didn't like the looks of. They are all Arabians or at least half arabians, and they are all big and strong, well shaped, and they're all very personable. 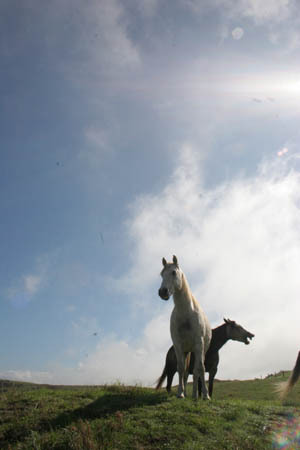 Paul took us on a little driving tour and showed us a grassy plunge that they see the horses charge down once in a while, so steep they are afraid to watch. Man From Snowy River cliffs! I didn't want to leave! I didn't get nearly enough photos. At sunrise or sunset, and with some more stormy clouds in all directions you wouldn't be able to take a bad photo. I will have to come back, because the Raven hasn't seen it yet. My last evening there, Carlos and Mariola made tapas and an outstanding salad for us while Paul roasted lamb, and with Madonna we Salut-ed each other. Cheers to Kiwis and Spanish and Americans and good food and drink, cheers to endurance that got us all together, and cheers to New Zealand!